’ he had to adjust himself, it was quite painful for him’ _ Sandip talks about the difficult period during Ray’s illness, and about the making of Uttaran, Ray’s last project he couldn’t complete. Sandip Ray decided to do the film, as a homage to his father, with the same unit as his father: ‘ I was constantly thinking of what he would have done, so it was difficult, because Uttaran was his film, not mine…’. Sandip talks also about Ray’s last three films: ‘my father told Utpal Dutta, the main actor who played the uncle in The Stranger ‘you have to be very careful because you are my spokesman in the film’ . 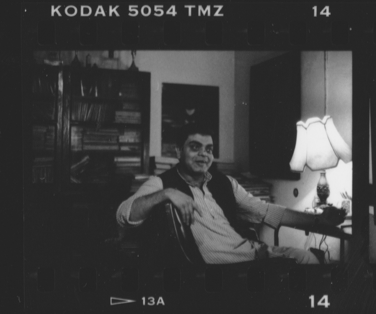 ’as a child, i could see that he was not an ordinary person’ _ Sandip Ray faintly remembers the shooting of Pather Panchali as a pic-nic :‘I thought they were having fun’, and explains how he became interested in cinema himself: ‘whatever I’ve learned, I learned from him’ (recorded in 1999 in Bishop Lefroy Road, Calcutta).